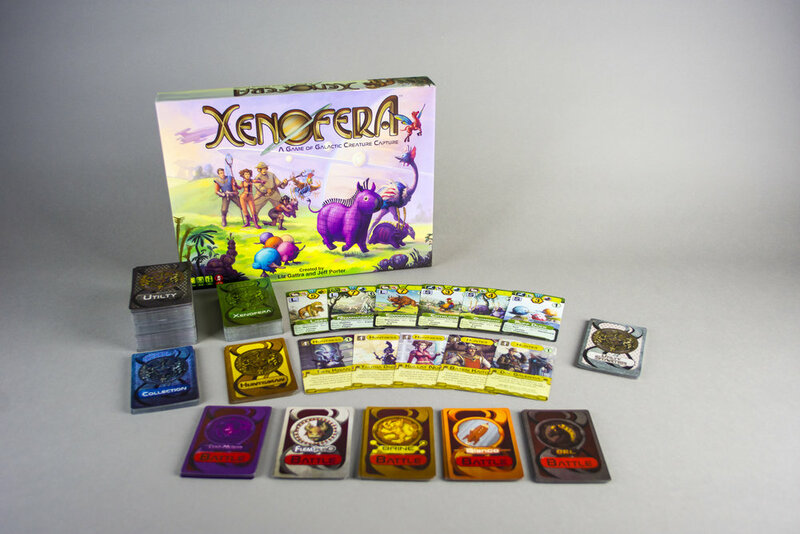 To be the greatest huntsman in the galaxy, you'll need to capture the most appealing collection of xenofera. But first you will need to recruit a crew and build cages. Only then can you capture the xenofera. The game consists of 4 decks of cards: the Huntsman deck, the Xenofera deck, the Collection deck, and the Utilty deck, 5 sets of Battle cards and 5 Player Turn cards. The game can support from 2 to 5 players, with an average game play time of 15 mins per player. Each player's area is divided into 2 areas: the Crew Quarters and the Cargo Bay. The player's Crew Quarters can hold the player's Huntsman, any number of Collection cards, and up to 5 Crew Members. Their Cargo Bay can hold up to 10 cages. The player to last catch a creature goes first. Play proceeds clockwise around the table. Each player's turn consists of 4 phases: an Action phase, a Build phase, a Capture phase and a Draw phase.